Immediately after turning in a research paper that was assigned to meet new state and regulatory guidelines rather than to enhance the educational potential of my class, I was grousing to myself about how yes, writing is important in all professions, but to require a written component in every class simply undermines the purpose of the Composition class we had to take as a prerequisite. 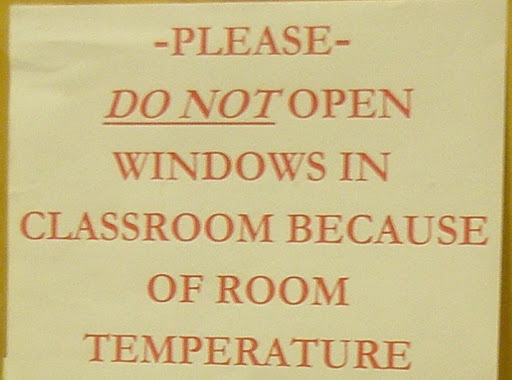 Now, here’s a case where writing skills would have helped tremendously. In a classic error of business/technical communication, the point is made, and then the writer continued to dribble on with an explanatory phrase. So, being in a helpful mood, I dashed off a supportive note to give the writer, and hopefully the impressionable students who walk by the sign, some positive guidance. Because I’m a giver. Here’s the note. The “Thanks!” on the end is to show I’m not a jerk. 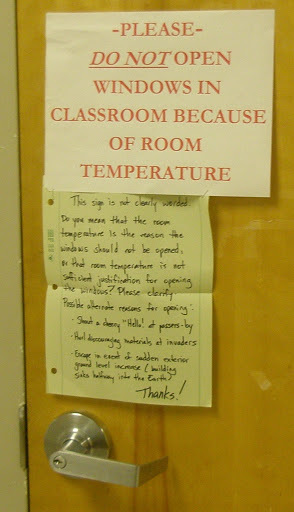 This entry was posted in Help, Jerk, School, Sign, Sinkhole, Temperature, Window. Bookmark the permalink. hysterical. I am currently sitting at a public library trying to stifle my laughter. You are a nut in the best way possible.